In the next chapter, once Yehovah started speaking, the Israelites shrunk back in fear, telling Moses to just relay Yehovah’s message to them, so they wouldn’t die from the sound of His voice. They feared for their lives from what they had seen and heard. Less than a year from that event, the command to observe the Feast of Trumpets is given. I would think just after Yehovah’s miraculous works at their exodus from Egypt and the parting of the Red Sea, the meeting with YHVH at Mt. Sinai had to be one of the Israelites’ most memorable events to this point. And the shofar was the sound that kicked it off. No wonder there’s no explanation of what we’re to remember. If you were at the mountain on that day, the sound of the shofar would have a very distinct memory associated with it: Yehovah meeting and speaking with His people. 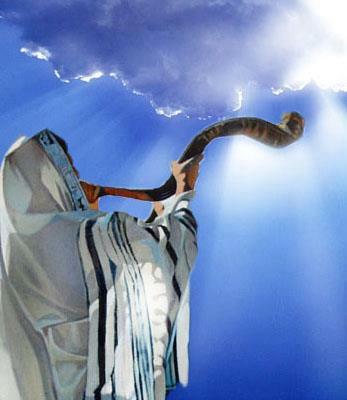 What’s more, Yehovah Himself sounded the shofar. The only other times the Bible references Yehovah sounding a shofar are in Zechariah 9 and 1 Thessalonians 4, and most Bible scholars believe these two refer to the same incident: Yeshua’s second coming. Adonai will appear over them, and his arrow will flash like lightning. Adonai Elohim will blow the shofar and go out in the whirlwinds of the south. The Lord of hosts will defend them; they will devour and trample the sling-stones. So, the first time Yehovah blew the shofar was when He was going to speak His commandments/His Word to His people. The second and only other time Yehovah blows the shofar is when Yeshua, Yehovah’s Word, comes to defend and gather His people. Obviously the commonality between them is when Yehovah meets His people in a supernatural and massive physical appearance. This is what we are to remember: We look back in remembrance of how Yehovah appeared to the masses in Exodus, and we look forward with expectation at Yeshua appearing to the masses at the end of this age. In fact, this is the case with all the seven Biblical Feasts. In each one we look back at an historical event, and look forward to its complete prophetic fulfillment. But in the case of this Feast, meeting with Yehovah takes preparation. The Israelites prepared for two days before gathering at Mt. Sinai. We, too, are in a time of preparation to meet Yeshua. Looking at the Feast of Trumpets historically, prophetically and in our current stage in the progression, we can see a total of ten things that remind us to prepare ourselves for the ultimate fulfillment of this Feast (codified by the rabbinic sages of the medieval era). If that’s not enough, we can also remember that part of Yehovah’s plan was fulfilled during Yeshua’s first coming on exactly the same dates as the Spring Feasts. I know I want to be watching and prepared during the Fall Feasts every year in case He continues rolling out his plan on those exact dates. See a list of all the Biblical Feasts and this year’s dates. This entry was posted on August 25, 2015 by Administrator. It was filed under Fall Feasts, Feast of Trumpets, Feasts, Holy Days, Mo'edim, Second Coming, Supernatural and was tagged with 1 Thes 4, 2012 feast dates, Biblical Feasts, day of remembrance, Exodus 19, Fall Feasts, Jesus, Lev 23, Messiah, Mt. Sinai, rosh Hashanah, Shofar, Yeshua, Yom Teruah, zech 9.
please let me know how to celebrate these awesome days,besides blowing the shoafar. Pam, the Biblical instructions for the Feast of Trumpets includes observing a Sabbath day Sept. 26, an offering, blowing the shofar and gathering with other believers. If you are not part of a congregation that observes this, you can still do the first three on your own. (Remember an offering doesn’t have to be a monetary gift to a church, search the scriptures for other types of offerings and give to Yeshua from your heart.) You can also gather virtually with others via live webcasts (I recommend Hebraic Roots Network) or live worship (I recommend the International House of Prayer). When I first started and had no congregation, I used to use the day to study the Feast and see God’s heart, so that I was more prepared for the next time it came around. May God enlighten the eyes of your heart as you pursue his will.